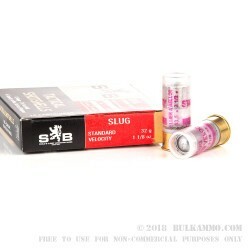 This 12 Gauge shotshell by Sellier & Bellot is loaded with a 1 ⅛ ounce rifled slug. With its projectile’s considerable heft and its supersonic muzzle velocity of 1,300 fps, this shell is ideal for home defense (take heart that it will make your walls seem as though they are made of crepe paper). Also, due to its short 2 ½” length, you may very well be able to fit an additional one of these shells in your home defense shotgun’s magazine -- that one extra shot may make all the difference in a sticky situation. This slug is also fit for hunting in places where a rifle’s bullet would pose too much risk of traveling into a populated area. The Czech ammunition manufacturer Sellier & Bellot was founded in 1825 by a French royalist who had managed to keep his neck intact by fleeing the revolution. Although they are now owned by Brazilian giant Companhia Brasileira de Cartuchos, they still adhere to the strict quality guidelines that has kept them afloat for nearly two centuries. 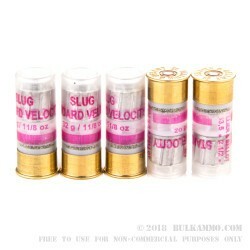 Q: Are these rifled slugs? I primarily use a rifled barrel to hunt, but a smooth bore for home defense. Rifled slugs in my rifled barrel mossberg 500 has never been a good combo. A: Hello Scott, Yes, these 2 1/2" slugs in 12ga. by S&B are rifled. These would work best in your smooth bore barrel, and a sabot slug would work best in your rifled barrel. Q: Are these high brass shells? Posted On: 9/11/14 By: Mike H.
A: Hello Mike, These 2 1/2" slugs in 12ga. by S&B are low brass. They make excellent hunting, target, and defense shells for your 12ga. shotgun. Q: I have a Mossberg 500. Will these shells work in that? A: Hello Greg, Yes, these 12ga. 2 1/2" shells by S&B will work in your Mossberg 500 as long as it is chambered in 12ga. 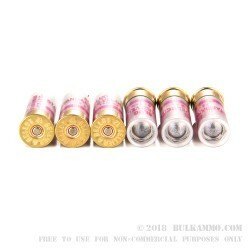 These make excellent target, defense, and hunting rounds. Q: I have a Remington 870 Tactical that's marked 2-3/4 and 3 inch shells on the barrel. Will it shoot these 2-1/2 inch shells safely? A: Hello, Yes, you can safely shoot these 12ga. 2 1/2" slugs by S&B in your Remington 870 12ga. shotgun. They make great target, defense, and hunting shells.